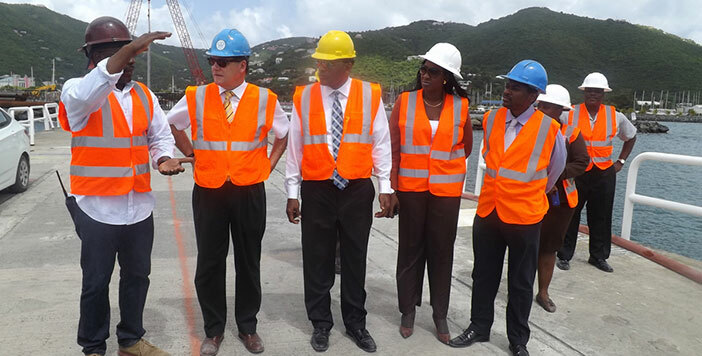 Wednesday, September 10 – His Excellency, Governor John S. Duncan, made his first official visit to the Ministry of Communications and Works yesterday and was given a tour of the cruise pier development project by the Minister for Communications and Works, Honourable Mark Vanterpool. While on site, the Governor observed the marine piling, landside pilling and land reclamation. He met with the project manager, marine and landside contractors and other technical specialist who gave an overview of the projects scope of works. 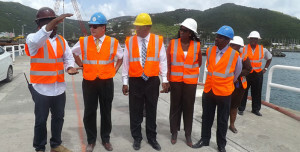 Minister for Communications and Works Honourable Mark Vanterpool stated that was important for the Governor to have the opportunity to observe the ongoing works at the pier. “The Cruise Pier Development project is a major infrastructural development project that has provided new job opportunities, revitalized the construction industry and will provide entrepreneurial opportunities and growth of the tourism industry.” The Minister pointed out. Meanwhile, Governor Duncan expressed his pleasure in having met the staff and he was also updated on the ministry’s work for the last two and a half years. “It was important for me to come to the frontend and see the challenges faced by the Ministry.” Governor Duncan explained. Minister Vanterpool also gave Governor Duncan a thorough report on the Ministry’s portfolio and the ongoing works that are currently being undertaken. Governor John S. Duncan was sworn in as the 16th Governor of the Virgin Islands on August 15. As part of his mandate, he will be spending his first few weeks in the Territory meeting with Government Ministers, senior government officials and members of law enforcement agencies in addition to other relevant agencies and departments.